For WebForms development that's always on time and on budget. 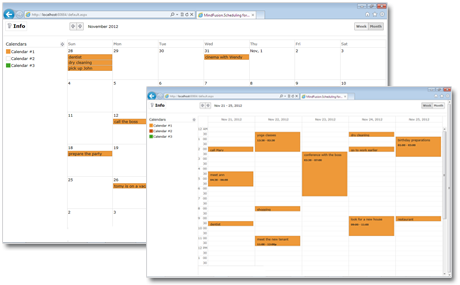 With Scheduling for ASP.NET you are sure to find the right presentation of your events, reminders and appointments. 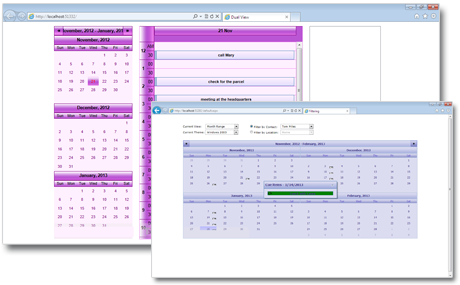 Whether you need a time table, a weekly plan or monthly calendar - you can have it all - in a minute. The views are changed with a mouse click, each view supports extensive set of events and style options. When it comes to interacting with the calendar everything is possible. You can create, move, modify and delete appointments on the run. You can use drag and drop to create and change calendar items quickly and easy. You can define tool-tips for better usability as well navigate fast among calendar dates with the mouse. The API of the component is built with the end user in mind. All members have self-explanatory names and are documented in details. There are plenty of samples and source code to look. The component provides numerous properties for customizing the appearance of the schedule and boasts a rich client-side event set. The appearance of each calendar and schedule is based on styles. The component also defines a set of themes that will change dramatically the look and feel of the calendar with a mouse click. For further customization, you can use the rich set of fonts, colors and text alignment options.